Applications for entry 2016-17 are now open for the Woolf Institute Cambridge Scholarships. 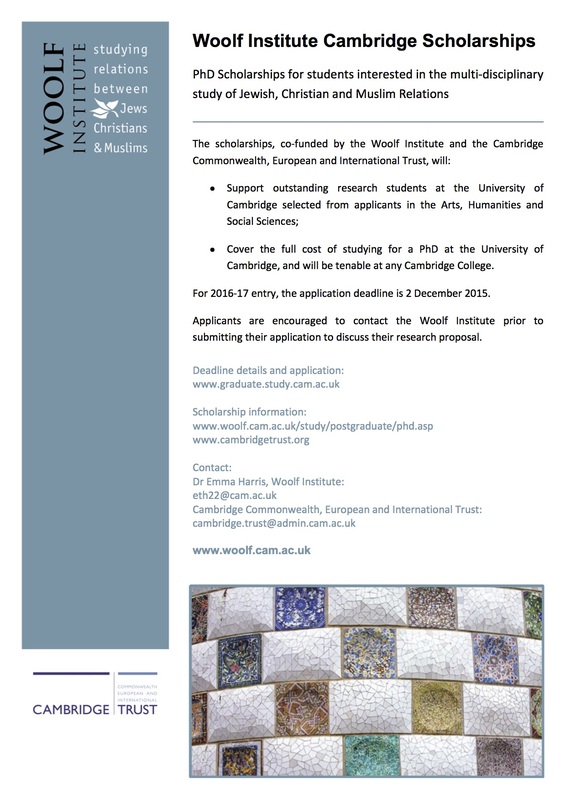 A partnership between the Woolf Institute and the Cambridge Commonwealth, European and International Trust, these scholarships are intended to support outstanding research students at the University of Cambridge who have the potential to become exceptional leaders of the future. Scholars will be selected from amongst applicants in the Arts, Humanities and Social Sciences. Their research must be relevant to the focus of the Woolf Institute – the multi-disciplinary study of relations between Jews, Christians and Muslims. The Woolf Institute and the Cambridge Commonwealth, European and International Trust will co-fund the successful candidates. Each scholarship will cover the full cost of studying for a PhD at the University of Cambridge, and will be tenable at any of the 31 Cambridge Colleges. Applicants for 2016-17 entry are required to apply to the University of Cambridge by 2 December 2015. Applicants must show evidence of excellence in their field of study and formulate a coherent research proposal. Applicants are encouraged to contact the Woolf Institute prior to submitting their application to discuss whether their research proposal is relevant to the Institute’s focus. Click here to read the first awardee’s reflections of his first year on the doctoral programme at the University of Cambridge.